Powered by Norton’s proven parallel twin and suspended in their simple and rigid “Featherbed Frame”, the bike, the Atlas features classic British styling and an evocative name. 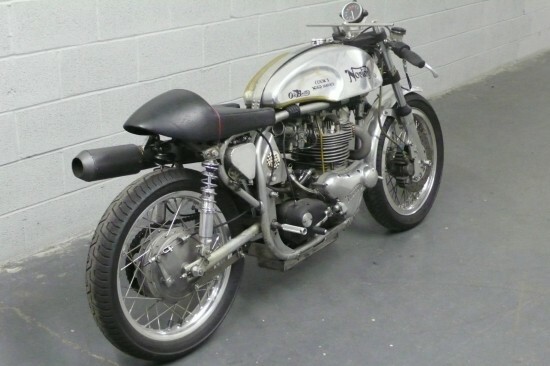 The British biking industry is rightly famed for its singles and parallel twins, and Norton used both to great effect, first with their long-lived Manx, a bike so elemental and right it was competitive literally for decades, then in a line of twins starting with the Dominator. The 500cc Dominator gave way to the 750cc Atlas. With lower compression and a single carburetor, it wasn’t much more powerful than the “Dommie” on paper, but supplied the torque and displacement required for strong US sales, the major goal of the model. As displacement grew, so did vibration, to the point where a solution was required before the introduction of the later Commando. 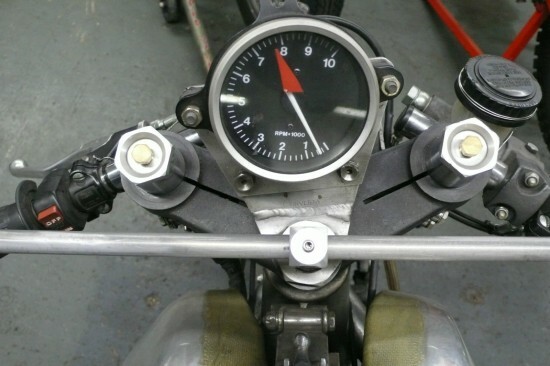 Reving to 7,500rpm and making over 70hp, this particular bike might possibly vibrate enough to shake your teeth loose, but it’s intended as a race bike so that really shouldn’t matter too much! And it has all that wonderful naked metal to stare at while the feeling comes back into your hands and feet. 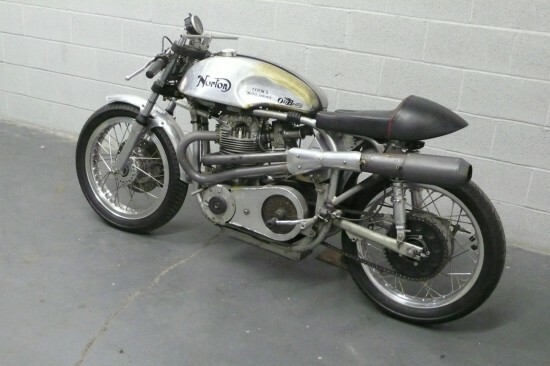 Here’s a professionally built, fully sorted Norton Atlas 750 race bike. 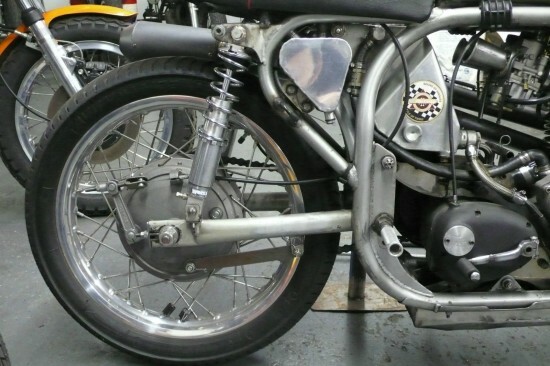 The bike was built, developed and raced by Les Cook of Cook’s Norton Service as a rolling business card in AHRMA’s BEARS (British European American Racing Series) class. The frame is a modified slimline Norton featherbed, WITH TITLE! This final version of the bike spares no expense in terms of mechanical components. Nearly everything is top shelf (and very pricey) aftermarket, from the Steve Maney Racing engine, ignition, exhaust, and belt drive, to the TT Industries, drum selector, magnesium-cased racing gearbox. Just the Maney parts and TT Industries gearbox sell new for approximately $15k. Add to that alloy fuel, oil and catch tanks, shouldered alloy wheels, Lockheed Racing caliper front disk, Grimeca cush-drive rear hub, Works Performance shocks, electronic racing tach, two race seats (Manx-style and alloy cone type), Amal Mk2 carbs, magnesium steering clamps, and Cosentino Engineering cartridge fork internals, and the major parts total grows to well over $22k, before considering all the miscellaneous items: cables, manifolds, clip-ons, timing set, race tires, chain, petcocks, plumbing, hand and foot levers, and wiring. Figure another $1k for those items. Then there’s professional assembly of the race engine, $3-5k. So, just the parts and engine build and we’re around $27k. But then, this bike is complete, available now, fully sorted, fully safety-wired and with a fabricated alloy belly pan, newly made fairing mounts (no fairing though). 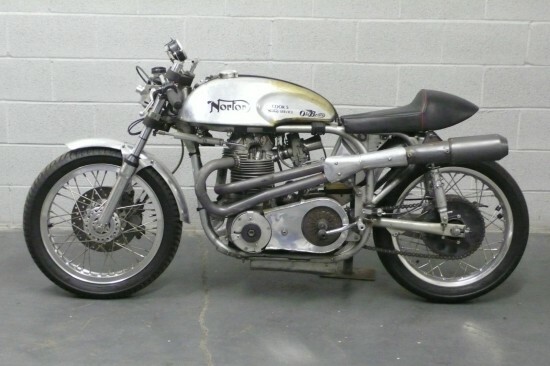 If you tried to build a Norton slimline featherbed-based race bike of similar specification, you’d be in to it for at least $25-30k, plus a few hundred hours more in assembly, tuning, sorting, safety wiring, etc. What’s your time worth? According to Les’s dyno sheets, this bike generates 72.1 rear wheel horsepower at 7400 rpm and 59.1 ft-lbs torque at 5300 rpm. Importantly, hp was 70 or higher from 6500 to 7500 rpm and torque is 50 ft-lbs or more from 4200-7500rpm. 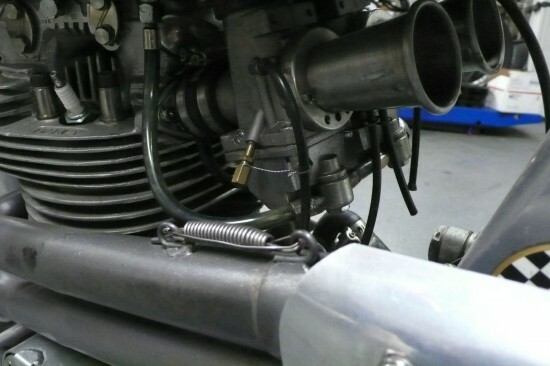 This is a well-tuned, well-sorted stonker of an engine! The listing also includes a comprehensive account of the parts that went into the build and a bit of history. This bike isn’t quite complete, but wouldn’t take very much to make it so: just add fairing. Or you could just ride it as-is. Take this beast to the track, or maybe convert it to street duty? I wonder just what that would require… Either way, you’ve got some pretty serious performance on tap for a fifty year old motorcycle! Bidding is almost at $13,000 with five days left on the auction. Jump in now for this chance to own a fire-breathing British classic!